This delicate and beautiful pendant is sculpted of hand mixed green polymer clay and washed with layers of green and brown for depth. The green leaf frame surrounds a vintage dragonfly illustration cutout. 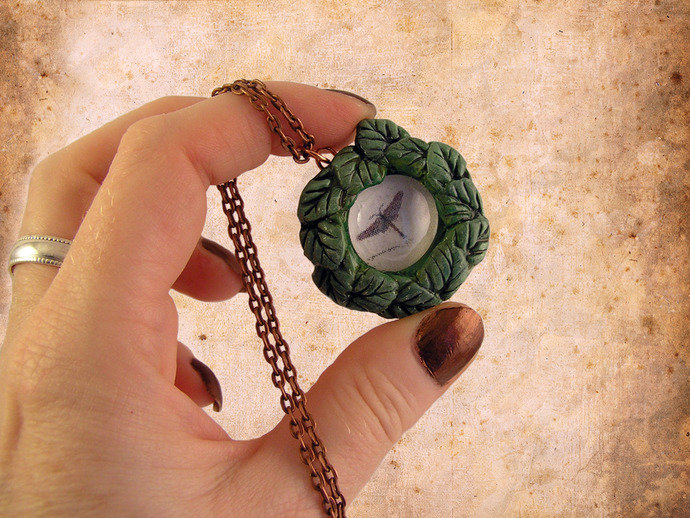 The lush Victorian style of this pendant will go with any outfit, steampunk or otherwise! Available with your choice of copper chain with or without lobster clasp (shown in photos), or adjustable brown, black, or tan hemp cord. Please include your choice with your order.